Last year, fifteen intrepid readers (seventeen at one point, but that’s a long story) joined me in Athens and spent eleven days touring mainland Greece. 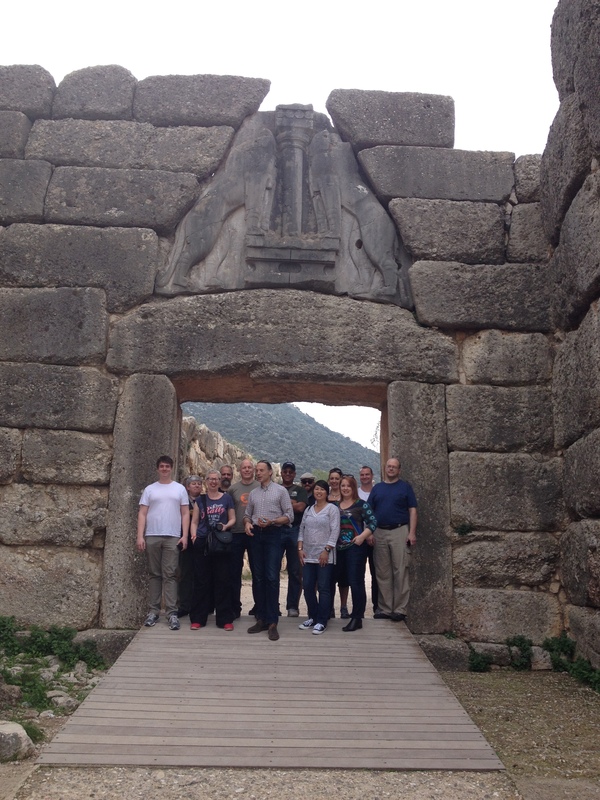 This is us at the Lion Gate at Mycenae. Look, I’m biased, but it was incredible. For about ten years, my friend Aliki Hamosfakidou of Dolphin Hellas had egged me on to run an author-based historical tour, and I had… resisted her. I imagined–heck, I don’t know what I imagined, but let me tell you what I didn’t imagine… I didn’t imagine the best tour of my life with fifteen instant new friends who all shared my passion for Ancient Greece. And we’ll follow the itinerary below. Prices and fees and stuff are at the end. Here’s my unpaid advertisement. The company last year was excellent. The food was very good, the hotels, wonderful, and the scenery and historical sites so breath-taking, so (literally) awesome that we began to mutter ‘look, another incredible view. How do they do this?’ and ‘Wow, another battlefield.’ We have our own bus, which may sound lame, but proved to be like having a small, and supremely comfortable land-yacht. With excellent wifi. Finally, as a many, many-time veteran of visiting Greece, the tour is cheaper than almost anything you could arrange on your own. 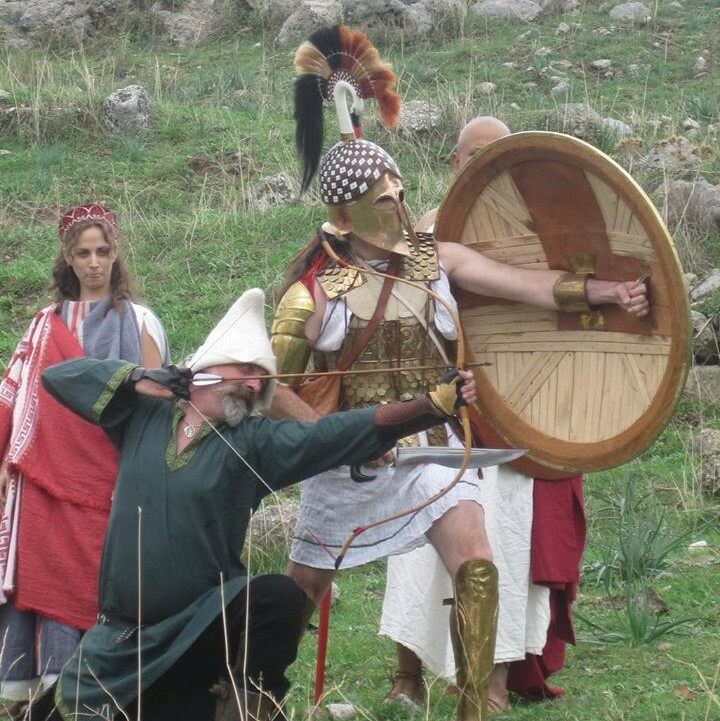 Oh, and there’s me, if you think that’s good, and a full day of demonstrations of Ancient Greek weapons and tactics (and Persians ditto) at Plataea! Oh, and I teach a sword class every morning. Free. This is our class at Delphi, complete with breath-taking view and massive hangover. See? You want to come. We have roughly 30 slots, and I suspect 14 of them are already spoken for. Day 10 (Nov. 11, Tuesday): Individual transfers to the airport & departure. The airport is 30kms from the city centre and takes about 40 minutes. – 9 overnights in good 3* superior & 4* hotels (3 in Athens, 3 in Nauplion, 1 in Olympia, 2 in Delphi). Prices and fees and stuff are at the end. It was wonderful that 2014 Pen and Sword. Great company, great sites, and great museums! I did bring some of my bows and some battlegear with me. I am a battlefield tourist with a bow and added Marathon, Thermopylae and Plataea to the list of battlefields where my arrows flew. 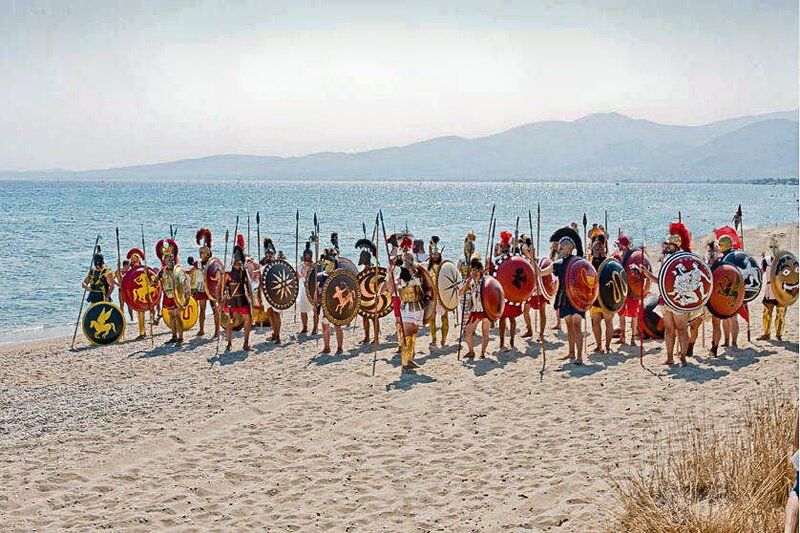 (besides Sluys, Azincourt, Crecy, Poitiers and Hastings) What I really like is that this year there will be a whole day to toy with Greek/Persian wars era weapons, gear and tactics at Plataea. 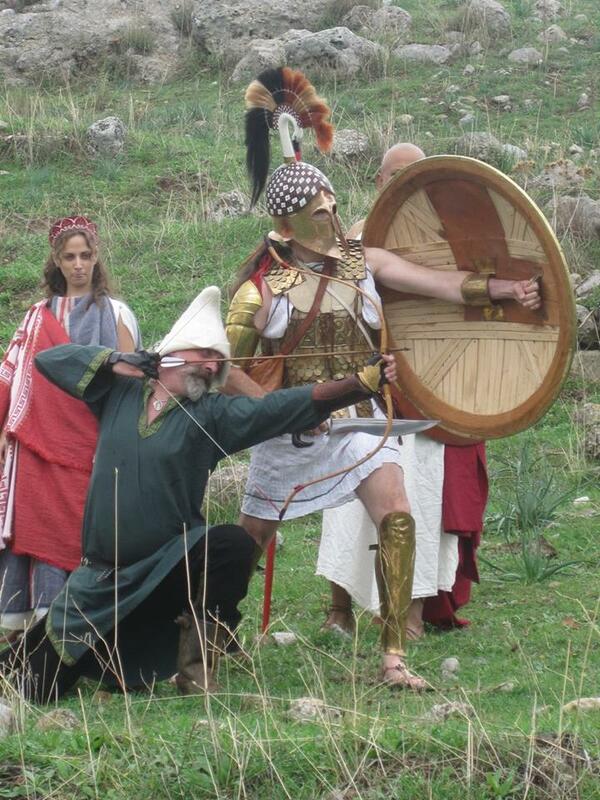 I had the privilege to do some archery demos and a penetration test on a Greek aspis at Plataea-on the 2014 tour- but the time was too short to allow everybody to shoot a bit and teach the basics- the same applied to Greek hoplite spearfighting. Unfortunately I cannot make the tour this year, and Plataea is on the last day of the tour.. but I hope that somenbody else will be able to take care of the archery part. I can’t say enough good things about this tour. The company, the sites, the food, the wine! It is also a really good deal – look at comparable tours that cost twice as much or more. The Pen and Sword Tour is an experience that you do not want to miss! We would totally recommend it and we are going a second time around! Aside from the breathtaking views, you have the opportunity to meet new people and listen to Christian talk about the various battle sites. We have been to Greece before but this experience is definitely not one to miss! Great food and great conversations! We were fortunate to meet such a great group of people and have become good friends!! It is also a great package for the price!! Please come join us on this adventure! You do not want to miss it! Btw this is Cindi D! I have nothing but good things to say about the Pen and Sword tour. 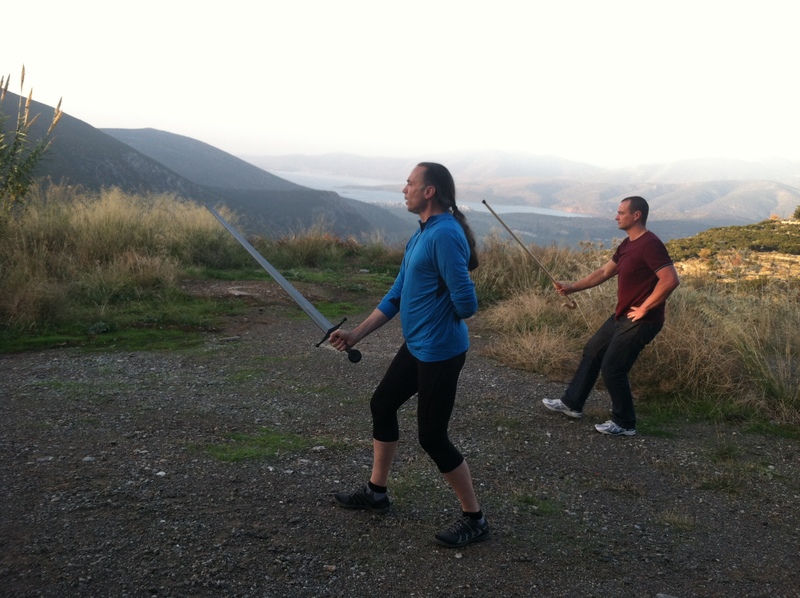 I have travelled to Greece before, and while it was a fantastic trip, the Pen and Sword tour offered more than a trip my wife and I were able to plan. The sites that we visited were amazing, but to be there with a group of like minded individuals, and being led by an incredibly knowledgeable guide AND one of your favorite authors that has as much knowledge about the events surrounding the historic sites was incredible. The time of year the tour takes place is also a huge bonus. With the tourist season almost over, we did not have to que up at all, and we were able to really enjoy the sites without having to contend with other tourist. All in all it was one of the best trips of my life. I still keep in touch with the incredibly diverse, like minded individuals that I am very happy to call friends. I went last year and will attend again this year. The sites were wonderful. The company was amazing. I could not have wished for a better group of people to tour with. The fact that at least 10 of us are going again speaks volumes. The addition of wine tours this year is a bonus! wine tours…sword class. wine tours… sword class…. Oh, I promise you, they do… 🙂 It is, however, better in general to have the swordplay first, and the wine later.